Manual [button F on chart]. Semi-automatic [button F on chart]. Automatic [button A on chart]. There is no need to sit long hours in front of the computer - you can trade even when you far away from your computer. 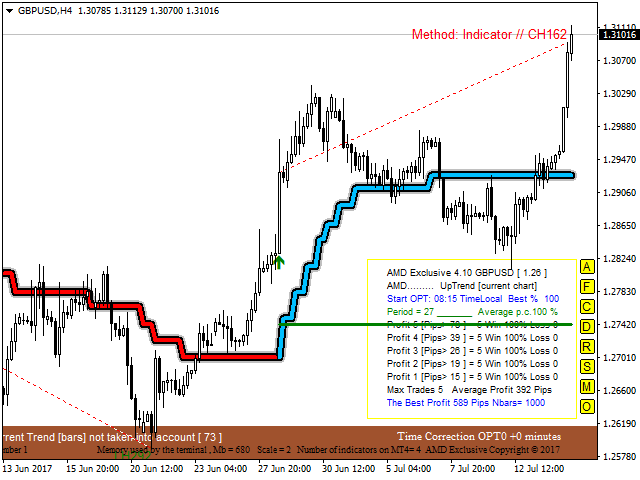 AMD Exclusive Free works only on USDCAD currency pair. The full version of the product has no limitations. Computer monitor from 21-inch to 27-inch - recommended (for comfortable operation). Memory 4 GB RAM or higher - recommended. Basic knowledge in the Forex trading. Button [A]: Overbalance - automatic. Button [F]: filtering of trend based on the Overbalance (manual and semi-automatic). Button [C]: enable/disable the fixed scale mode. Button [O]: start optimization from M15 to W1. Method to Determine Trend - Price Action/Indicator/Auto. Number of the analyzed bars [Nbars on chart] - e.g. 480 bars H1 = 20 days. AMD Trend Period - manual optimization (3,4,5,..28). Show Take Profit - true/false. Start Optimization - the local time of a computer, where the client terminal is running. Alert - sound alert on chart. Push Notifications - Send notification on a mobile phone. AMD control.csv - Using the defined command types you can create commands in csv file. Email - Send alert via e-mail. Show all optimization results - true/false. False-delete all optimization results. Line for EA (Not iCustom) - true/false. Trend line on chart for EA. Green for uptrend and Red for downtrend. Size digits on chart - only red and green digits. Color Trend [background] - default yellow. Sound file (Start Optimization) - Record your own sound effects for indicator. Sound file (End Optimization) - Record your own sound effects for indicator. Automatic Optimization = true (first start). Start Optimization = Time Local (sound "wait.wav"). Automatic Optimization doesn't work in strategy tester. Transferring files between your smartphone and indicator and vice versa. How does this work? Send a command from your smartphone and get screenshots of the chart. Required application that synchronizes and backs up files such as photos, documents, and e-mails between desktops, laptops, servers, and external drives. More details? Please write to me. 1 = WindowScreenShot and push if candle closed [one-off event]. 2 = WindowScreenShot and push if candle closed [continuous event]. 3 = WindowScreenShot and push if candle closed [one-off event]+big snake. 4 = WindowScreenShot and push if candle closed [continuous event]+big snake. 5 = WindowScreenShot and push [one-off event] return 0. 6 = TimeFrame M15(15) return 0. 7 = TimeFrame M30(30) return 0. 8 = TimeFrame H1(60) return 0. 9 = TimeFrame H4(240( return 0. 10 = TimeFrame D1(1440) return 0. 11 = Reset and small snake return 0. File will be created in the folder MQL4\Files.